What happens when college and university administrators are unable to prevent white supremacists from spreading racist propaganda on their campuses? The president’s admission to Black students underscores historian Nathan Connolly’s argument that liberalism is insufficient in addressing white supremacy. The university’s failure to prevent all of the the racist incidents on campus over the last few years illustrates the limits of “Diversity, Equity, and Inclusion,” the president’s liberal strategic plan. It also demonstrates the need for students, faculty, and staff to once again engage in mass direct action and radical politics previously pioneered by Black campus insurgencies. Black students have led this fight at the University of Michigan for almost five decades, starting with the first Black Action Movement campus strike in 1969. However, the outcomes of the third iteration of the Black Action Movement (BAM III) and the United Coalition Against Racism (UCAR) during the 1980s illustrates how direct action, external pressure, institution and movement building not only buttressed liberal diversity politics. 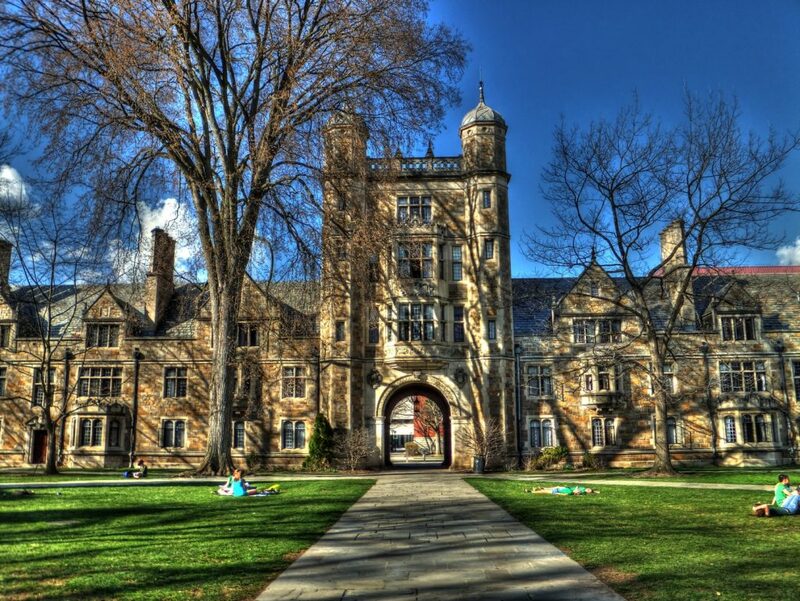 Their actions spurred the institutionalization of sustainable radical politics at the University of Michigan. Black students like the Free South Africa Coordinating Committee’s Barbara Ransby called for UM to condemn the incident at a rally on the Diag on February 6, 1987. After meetings between Black students and administrators, UM president Harold Shapiro announced a $1 million program devoted to addressing racism on campus.3 However, the appearance of a racist cartoon in The Michigan Daily and a radio broadcast of racist jokes over UM’s station, WJJX, further illustrated to Black students that racism persisted on campus. 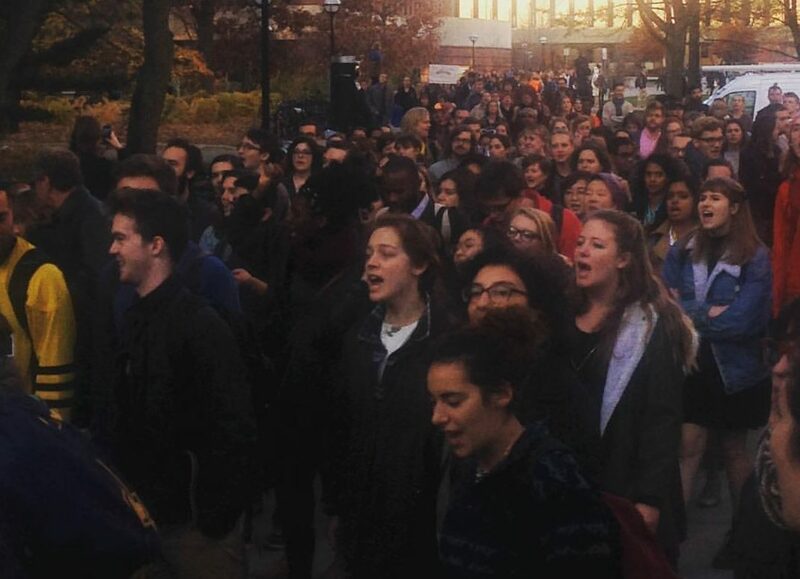 Direct action and the bad publicity UM received due to the racist incidents allowed the movement to push the new president, James Duderstadt, to devise and implement the Michigan Mandate, a campus-wide diversity action plan. Released in 1988, the mandate aimed for students of color to represent at least thirty percent of the student population by the end of the 1990s. It also outlined plans to hire and retain more faculty and administrators of color. Low Black enrollment, police shootings, and the Black Lives Matter movement has reinvigorated Black student protest at the University of Michigan. Black students launched the #Being Black at the University of Michigan, an influential campaign that dramatized the decline in Black enrollment in 2014. Their demands included more funding for BSU, affordable housing, more emergency funds, the construction of a new centrally-located multicultural center, and ten percent Black enrollment. The negotiations between #BBUM and the administration led to some gains, including a new Trotter, and the construction of the Diversity, Equity, and Inclusion strategic plan. Recent protests organized by Students 4 Justice (S4J) and other Black students have the potential to replicate the sustainability of BAM III”s and UCAR’s. Last school year, S4J responded to a rash of white supremacist, Islamophobic, and misogynist flyering by pressuring the university to improve its rapid response through mass protest. They led an occupation of one of the main computer labs on Central Campus where hundreds of students and faculty attended. They also organized and led a massive student walkout and demonstration attended by hundreds, including Reverend Jesse Jackson. The point of S4J’s politics, however, was not just to control space through mass direct action, but to transform it. On February 9, hundreds of students occupied the Michigan Union for several hours. They demanded the University to fulfill its promise to meet #BBUM’s 2014 demands. Over the course of the sit-in, students from various racial and ethnic backgrounds engaged in chants, worked on their assignments, socialized, and discussed politics. 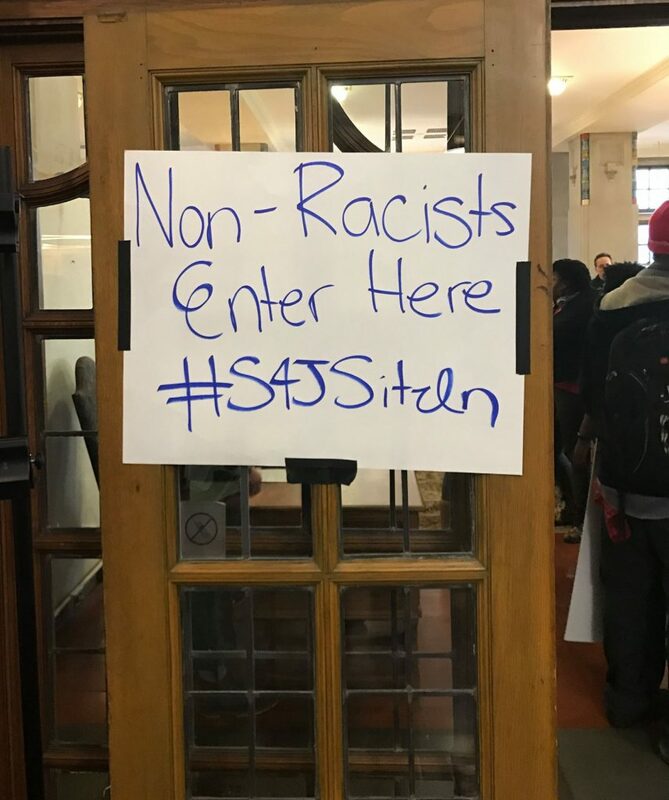 They hung anti-racist posters in the Michigan Union that said, “Black Lives Matter” and “Non-Racists Enter Here.” They turned the Union into an anti-racist zone. President Schlissel and the administration have shown that they are unable to create explicitly anti-racist spaces. However, S4J’s sit-in Union is one example of the type of transformative politics needed to sustain organizing, and to build the type of community and solidarity required to confront white supremacy. This year, students from S4J and the Class of 2021 continue to organize with an eye on holding the administration accountable. On the day of this writing, Black students, with the assistance of white allies, occupied a key intersection on campus and turned it into a study space. In addition, Public Health Master’s student Dana Greene, Jr. started a kneel-in on the Diag. Over time, his action grew to more than 200 students. Both of these actions demonstrate how Black students, in a sense, create their own “liberated spaces” on campus, even if momentarily. They also highlight the limits of liberal diversity action plans. Black student activism at the University of Michigan illustrates an important lesson in the fight against white supremacy on campus: mass student action, multiracial, ethnic, and national solidarity, and sustained movement may be the best path towards collective safety and justice on college and university campuses.